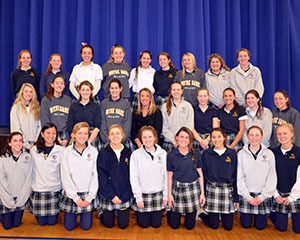 On February 3, Lisa Raymond ’91 served the students some wise words on her life at Notre Dame and beyond. Shortly after graduating from Notre Dame, she turned professional and went on to capture 79 career doubles titles, 11 grand slam titles and came home with the bronze medal in the 2012 Olympics Mixed Doubles in London. She also accomplished her childhood dream of competing at Wimbledon, which she did on more than 20 occasions. 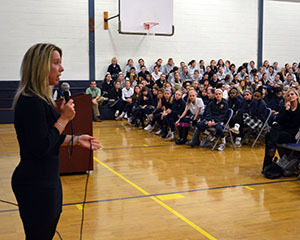 Lisa provided students with unique insights into the world of professional tennis and the importance of finding the balance between academic work and athletic opportunities. Lisa Raymond '91 taking questions from the students and posing with the high school tennis teams.